AUBURN, Ala.—Droughty conditions still linger in more than 50 percent of the state. Rains in recent weeks provided temporary relief, but issues caused by lingering conditions continue to make spring planting and forest management an issue. Producers and landowners are still dealing with the after-effects of the 2016 drought, in addition to the problems that accompany a lingering dry spell. Rains throughout the winter months, while welcome, were not enough to pull many Alabama counties out of the deep rain deficit. Pine bark beetles are taking advantage of the weak state of many trees in pine forests, causing foresters and landowners to make difficult decisions. What is a Pine Bark Beetle? Dr. Beau Brodbeck, an Alabama Cooperative Extension System forestry, wildlife and natural resource management agent, said “pine bark beetle” is a broad term used to describe several species of native Dendroctonus beetles that cause mortality in pine trees. These beetles have the potential to impact vast numbers of trees and potentially devastate large acreages if left unmanaged. Brodbeck said urban forest management techniques for pine bark beetles are different than those implemented in rural timberlands because of higher values and removal costs of landscape pines. Pine bark beetles are attracted to urban forests stressed by factors like construction root damage, physical trunk damage, lightning strikes, overcrowding, drought and storm damage. Alabama’s urban forests are particularly susceptible to pine beetle infestations following the major, late-season drought in 2016. Pitch tubes: pitch tubes on pine appear as white, popcorn-like spots of dried pine resin. This is the tree’s natural response to insect injury caused by adult beetles. Pitch tubes occur on the main stem of the pine from the ground to the canopy. This depends on the beetle species. New pitch tubes are soft with white or pinkish hues. Older tubes are white and hard. Old tubes may turn yellow in time. Egg galleries: Adult beetles will feed on vascular tissue beneath the bark causing galleries or etched marking on both the wood and inside of the bark once removed. Yellowing and rusty-red needles: As beetle populations and damage increase, needles will initially turn yellow followed by a rusty red color. Exit holes: Once beetles have completed their life cycles of between 18 to 25 days, the beetles will exit the tree leaving small, round pin-sized holes. This indicates beetles have left the tree and surrounding trees should be evaluated. Are All Pines Susceptible to Pine Bark Beetles? Brodbeck said while no tree is “beetle-proof,” there are certain species of pine less likely to become infested and die from pine bark beetles. 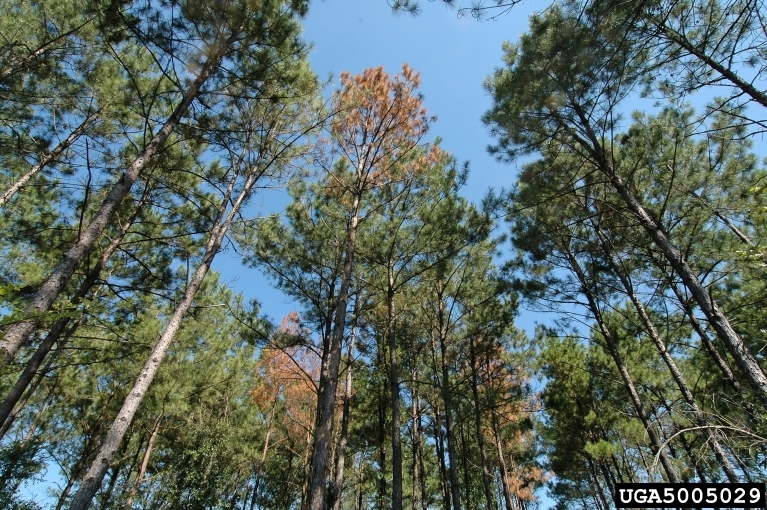 Loblolly and shortleaf pines are highly susceptible to pine bark beetles and rarely survive an infestation. Longleaf and slash pines are more resistant to pine bark beetles due to their higher sap flow. The higher sap flow helps repel beetles by expelling them with sap. In droughty conditions with low sap flow, even longleaf can have problems surviving beetle attacks. Longleaf pines should be closely monitored in case of an attack. For more information on pine bark beetles in the urban forest, visit www.aces.edu. Contact your county Extension office for more information. Featured image of Southern Pine Beetle by USDA Forest Service – Region 8 – Southern, USDA Forest Service, Bugwood.org.